OVCS sophomore Bryce Gruber splits between PCS defenders for a layup, during the second half of the Defenders’ 29-point victory on Monday in Gallipolis, Ohio. GALLIPOLIS, Ohio — Senior night done right. 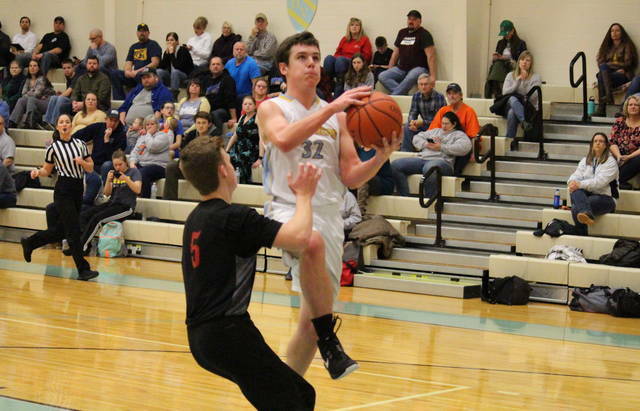 The Ohio Valley Christian boys basketball team celebrated senior night in style on Monday in Gallia County, defeating guest Parkersburg Christian by a 61-32 count. OVCS (5-14) — which never trailed in the contest — fought through just one tie, at 2-2, and led 12-7 by the end of the first quarter. The Knights were within two points after a 5-to-2 run over the first 2:30 of the second canto, but the Defenders didn’t allow another field goal in the half, closing with a 12-to-3 spurt for a 26-15 halftime lead. The guests made the opening bucket of the second half, but Ohio Valley Christian reeled off a dozen straight points and led 38-17 with 1:45 left in the third. After a pair of PCS free throws, OVCS scored the final five points of the quarter and headed into the fourth with a 43-19 advantage. The Defender lead grew to as many as 34 points in the finale, and the hosts cruised to the 61-32 triumph. Following the win, Ohio Valley Christian head coach Steve Rice discussed the team’s slow start and talked about his trio of seniors. “I thought we came out not quite ready to play in the beginning,” Rice said. “In the second half we came out with a sense of urgency, tightened up our defense quite a bit, and started making some shots. For the game, OVCS shot 26-of-72 (36.1 percent) from the field, including 3-of-14 (21.4 percent) from three-point range. Meanwhile, Parkersburg Christian shot 11-of-49 (22.4 percent) from the field, including 1-of-7 (14.3 percent) from beyond the arc. The hosts were 6-of-9 (66.7 percent) from the foul line, where PCS was 9-of-16 (56.3 percent). Ohio Valley Christian claimed a narrow 39-to-38 rebounding advantage, including 19-to-11 on the offensive end. The Blue and Gold also won the turnover battle, committing 14 and forcing 25. 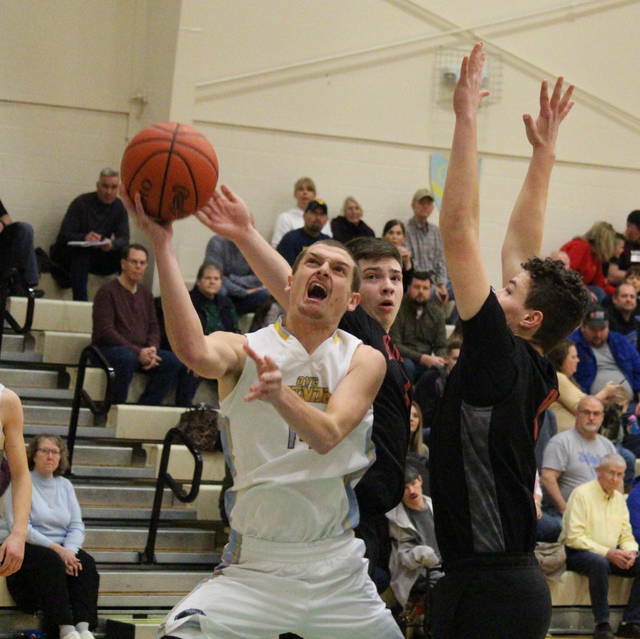 Collectively, the Defenders had 18 steals, 14 assists and two rejections, while the Knights earned six steals, three assists and a pair of blocks. Beaver led the OVCS offense with 23 points and six assists, accounting for all-3 of the Defenders’ three-point makes. Mark Oliver recorded a double-double of 18 points and 13 rebounds, while Dubs came up with 10 points in the win. Bryce Gruber contributed four points to the winning cause, while Jeremiah Swab, Miciah Swab and Joel Daugherty chipped in with two each. Miciah Swab led the OVCS defense with five steals, followed by Oliver and Dubs with three steals and a block apiece. Trey Bennett paced the guests with a double-double of 11 points and 16 rebounds, while leading the team’s defense with two steals and a block. 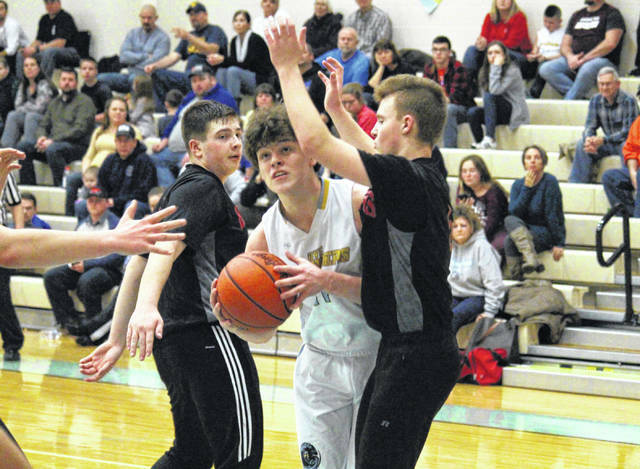 Izaia Nazzlered scored nine points for PCS, Wyatt Eaton added eight, while Kaleb Dean scored four. 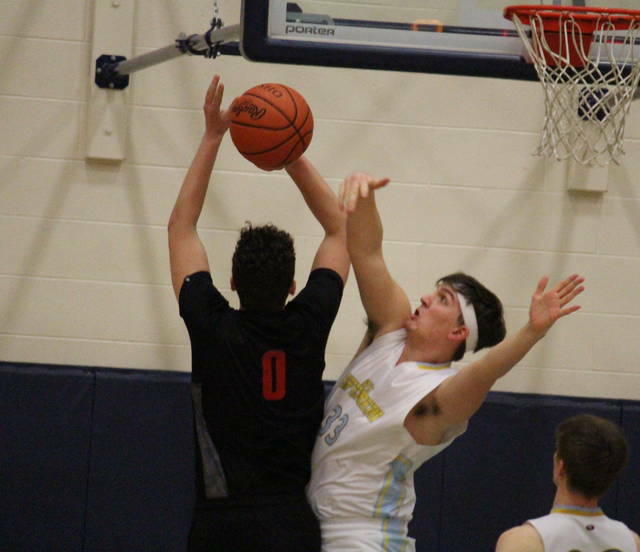 After hosting Heritage on Tuesday, Ohio Valley Christian will prepare for its postseason opener on Friday at New Hope Christian in Circleville.